Watford manager Marco Silva has challenged his players to tackle Chelsea at Stamford Bridge with the same fighting spirit which beat Arsenal. The Hornets climbed up to fourth place in the Premier League after coming from behind to beat the Gunners 2-1 with a stoppage-time goal from Tom Cleverley. Much was made of the post-match comments from captain Troy Deeney, who claimed Arsene Wenger's team had lacked "a bit of cojones" needed in the scrap for points. While Silva is determined to move on from the fall-out - having had words with the striker, whose penalty levelled the match with 20 minutes left - the Portuguese coach would like more of the same collective effort against the reigning champions. "I feel pride when I see the way they worked in the last match. I saw the ambitions we had in that moment, when we scored the 1-1 against a big team like Arsenal, we didn't go back, we continued in our work and tried to achieve a better result for us," Silva said. 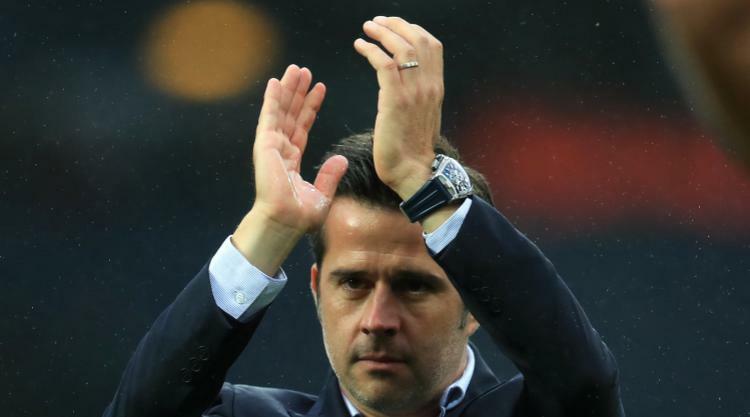 Despite their lofty position, Silva, who took over at Vicarage Road in the summer having left Hull, remains determined to keep everyone's focus on the job in hand. "You want to compete every match and that's our way, it's important we show our ambition during the matches," Silva told the club's official website. "Everybody knows what our goal is, and everybody knows for us it is not important what position we are in (now), but of course if you look at the (current) table it is good for everybody." Watford have recovered strongly from their 6-0 trashing by Manchester City to win two of the past three games. Chelsea, meanwhile, come into Saturday's televised lunchtime clash on the back of successive Premier League defeats which leaves them in fifth. Antonio Conte's men, though, showed their resilience with a battling 3-3 draw against Roma in the Champions League on Wednesday night. Silva knows just what the challenge is in front of his Watford team when they head to west London. "You prepare to go into the match at Stamford Bridge to compete, but of course the favourites are Chelsea," he said. "In football the last (few) results are really important, but for one team like Chelsea with the player they have in their roster, it is not the most important because they have players who can decide the match in one minute. "They want to change their last two results from the Premier League, when a team wants to become champions, that is normal."